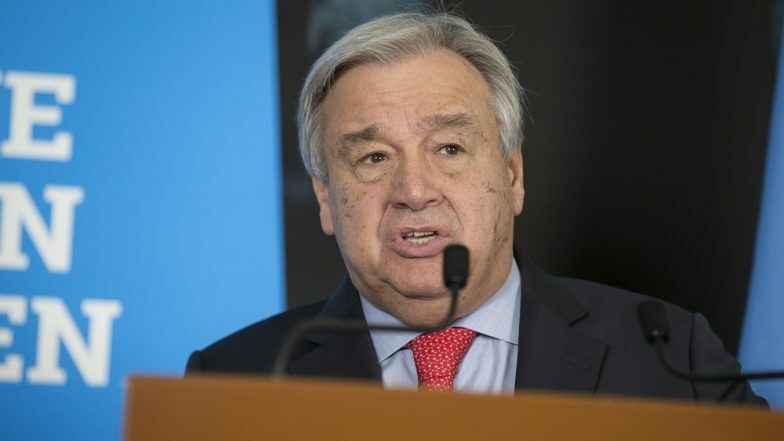 United Nations, April 16: The UN owes India $30 million for its contributions to the peacekeeping operations, according to Secretary-General Antonio Guterres. Peacekeeping operations "face frequent cash constraints that force the organisation to postpone the settlement of its obligations to troop- and police-contributing countries", he said in a report released on Monday to the General Assembly on UN's financial situation. He blamed the failure of member nations to pay their budget dues on time, in particular the US, for the arrears to India and other countries that send personnel to the peacekeeping operations. UN Chief Antonio Guterres 'Concerned' Over Deaths of Two Indian Journalists. At the end of the last budget year for peacekeeping 2017-18, there were arrears of almost $2 billion, he said. Without mentioning the US by name, he said: "The overall level of unpaid peacekeeping contributions is also affected by the decision of one member state to contribute at a level approximately 3 per cent below its applicable rate of assessment." Under President Donald Trump's budget belt-tightening, the US, which is the largest financial contributor to the UN, has said that it would cap its dues to the peacekeeping budget at 25 per cent instead of the 28.47 per cent assessed by the UN. UN Chief Antonio Guterres Calls for Action to Protect Rights of Rural Women. He noted that the arrears owed to one TCC amounted to the financial contribution it would have to make in 200 years and in the case of another 100 years. The General Assembly sets the annual assessments for each country to the general and peacekeeping budgets as a percentage of the total budget using a complex formula that takes into account how rich the country is and other factors. India's assessment for the general budget is 0.834 per cent, and it paid the full amount of $23.25 million in January. Guterres warned about "the deteriorating financial health of the organisation". "At the end of 2018, the UN truly reached bottom when it experienced the deepest deficit in a decade, one that completely eroded all its available liquidity reserves. India Essential Component of Multipolar World, Says UN Secretary General Antonio Guterres. "The level of arrears at the end of 2018 was $529 million, equivalent to more than 21 per cent of that year's assessments and nearly 150 per cent of the liquidity reserves", and as a result the UN started this year with only $30 million in cash reserves instead $353 million. He added the trend must be urgently halted and reversed with "common-sense solutions that will address the present unsustainable situation".